Hi everyone and welcome, thank you all those who left their answers to yesterdays question, what diverse places we would all like to visit, hope one day you all get the chance of making these dream journeys. There will be no question today, I have been sufferng from a horrible Migraine today and am finding it quite hard to focus on the screen, so I will just ask you to leave a comment below this post and don't forget to check back tomorrow to see if you are the lucky one. I am sure you would all love to own this fabulous Lying Matthew Stamp, so don't forget enter your comments below and It may be your lucky day. Check back tomorrow to see what is behind Window 23. The winner of Yesterdays Good Luck Charlie stamp is Sharon fron Cards n Greetings, her number - 4 - was chosen by Random.org. Well done Sharon can you let us have your address so Charlie can soon be bringing his luck to you. Don't forget everyone check back tomorrow after 00:01 GMT to see who has won todays gift. Hi Katharina thankyou for giving us the chance to win this beautiful stamp. I have just bought my first 3 woj stamps and they are so beautiful and would love to win this one i will leave a comment and a link on my blog now Thanks again. 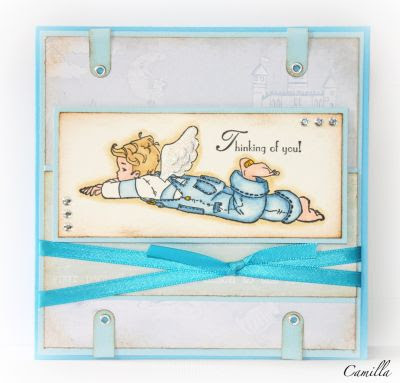 Oh another cute angel stamp, you gotta love angels at this time of year....great colors on the card. I hope your migraine will be better soon Jacqui! Gorgeous card & super-cute stamp!! Great news with the shipping costs! Sorry you're not well, you rest and get better. I really like this image...it makes me dream away too! Cute stamp,hope your head feels better soon and thanks for bringing us another stamp for a lucky winner. What a cute little angel! I love the card. Hope you're feeling better soon! This card is so wonderful! I love this angel Matthew! I always think of my DS when I seen him! I would just love to win him! BEAUTIFUL Card!!! Love that stamp... It is soooo cute!!! Just recently discovered WoJ stamps. Adorable! Hi! Thanks for a chance to win this gorgeous stamp. Hope you start feeling better really soon. Wow this card is beautiful!! I just love the colors and the layout. Love how you did the ribbon also. Count me in on this adorable stamp. Thanks so much for a chance. I so love the colors on this card. I also like the news about your shipping policies. Thank you. I hope you fell better. I hope you get relief from your migraine. Wow, Camilla, thats a nice card! That boy is sooooo cute! Hope your headache goes away! They are never much fun! That card is cute and I love that image as well! Cute stamp again, as always. Hope you feel better soon! This is adorable! A blue beauty...I really like the idea of the "tabs". I am so sorry you have a migraine. I have chronic migraines and have had them since I have been 14....and I will tell my age here....so I have been suffereing with them for 34 years. I am currently trying some medications from the doctor to prevent them..so far, so good. I hope they work, I never want another one and I hope yours goes from you quickly to never return. Beautiful card, awesome stamp! Hope you are feeling better soon, Jacqui! I Love matthew !! he is adorable,I would love to own it!! Thanks for the inspiration and the chance to win your kool stamps. Hope you recover soon from your migraine. I am well aware that only modern chemistry keeps me from daily migraines. It took 20 years for my Doctors to find the right preventative. but life is good now. I can handle one a year with ease. Good luck to you. ohhhh a Migraine.... I am so sorry that you have to deal with that. Stay in bed and get your rest. I hope this will pass soon. This is definitely not something a person needs this time of the year. Oh Jacqui I hope you are feeling better real soon! I also suffer from migraines and know they are NO fun! Sending you lots of GET WELL SOON WISHES! Camilla that is a beautiful card! Love your creations hun! Katharina, you are so wonderful to be so generous with your holiday calendar! Thanks again for all you do for us! Oh my, you are feeling so poorly and yet you think of us. I would love the chance to receive Matthew, my youngest grandson's name is Matthew. This would be great. Feel better real soon!! I hope you're feeling well soon. Lovely card. That stamp is adorable! Cute card!! Luv the colours used. Hope you are over your migraine soon, not good at this time of year. I would love this Matthew as I have a grandson with the same name, not sure he is such an "angel"
This boy is such a cutie! I hope you feel better again, soon! Wow, this card is wonderful and I love the stamp. Lovely card! Love the beautiful stamp. Sorry to hear you are not feeling well, hope you are feeling better soon. Thanks for the chance to win such a lovely stamp. I hope that you are feeling better very soon...I dislike migraines...never fun. Thank you for a chance to win this darling stamp! Thank you for the chance to win this beautiful stamp. I don't think anyone can make a bad card the stamps are so stunning. Beautiful card and stamp. Thanks for the chance to win. Hi Katharina and congrats to Sharon on winning the stamp please can I go into the draw thank you. So sorry to hear you're not feeling well...hope you got some rest and are improved. I am just loving all the beautiful stamps..thanks for giving us a chance to win them! Hope your migraine gets better. Get some rest and I truly hope you enjoy your Christmas. Another beautiful card with a lovely stamp. Gute Besserung, das ist wiedermal ein tolles Kärtchen geworden. Hope that your migraine will pass soon! Lovely card and as always beautiful stamp. Feel better soon. The card is great. Have a wonderful Christmas. Ich hoffe es geht Dir bald besser und kannst Dein Weihnachtsfest geniessen!!! only 3 days left, i,m getng excited now,i'm like a big kid really.thanks for another chance to win these wonderful stamps. Hope you feel better soon. Lovely card. Matthew is so cute. Dieses Motiv ist allerliebst und die Karte zauberhaft. Gute Besserung..bald ist ja der Weihnachtsstress überstanden. Thanks again for giving us the chance to win! I hope you will be fine soon!!! ...Matthew wäre ein "himmlisches" Geschenk...! Die Karte ist superschön und das Motiv zuckersüß! Oh, this card is just so lovely and I think the stamp is soo versatile! I love it! Oh, yes and, Jacqui, I hope you get rid of that migraine soon!!! Wow, thats a great Card again! Love your card and the stamp! Thanks for the chance of winning one of these beautiful stamps. What a beautiful card, I love the image and the colours you have used. Wieder so ein wunderschöner Stempel. Oh, poor you Jacqui. Hope you get rid of it soon, it's not the time of year to have to stop everything. 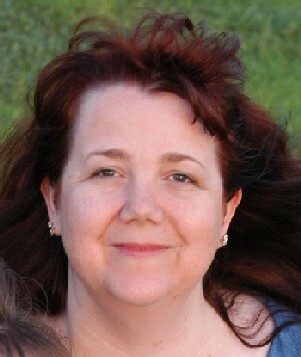 Jacqui, Sorry to hear you're not feeling well, I hope you'll feel better soon. This is a lovely stamp, Camilla did a great job with it on this card. Love the card and the colouring is gorgeous! Thanks for the chance to win this stamp Katharina. I hope you are feeling better now, I would really like to win this beautiful stamp! Very cute stamp and card! Hope you feel better soon, Katharina! migräne ist ja total mies, gute besserung. ein süßes kärtchen und süßer stempel. engel sind was tolles. Hope the migraine has now gone. great news on the shipping costs news. hope you're feeling better Jacqui. I love the card, so many great ideas from all the team. At work now so better get on and do something! Cute card! Love the layout! Camilla has yet again done one gorgeous card. This Matthew stamp is adorable. Ich liiiieeebe diesen Stempel!! Ganz ganz tolle Karte! Dir wünsch ich gute Besserung!! Hope you feel better soon sending you (((Hugs))). My mom and sister also suffer from migraines! I hope you are feeling better today. I just LOVE this card, and that adorable stamp. I think my angel would have either red hair (like my DH) or brown (like my DSs) :-)! Oh dieses Motiv find ich total goldig-habenwill!!!! Another great card and stamp. Thanks for the chance to win. gorgeous card Camilla! And go sleep Jacqui! Poor you! This card is beautiful and I really love this stamp!!! such a beautiful card - I like it very much. Oh my gosh I hope you rid the migraine! Those are awful, expecially around Holidays you do not need that. Thanks agian for a chance to win! Katharina, hope the migraine shifts soon, take it easy and thanks once again for the opportunity to win another one of these wonderful stamps. Hope you are feeling better! I so enjoy your blog and stamps. This stamp is one of the few I love but don't have yet so I keep my fingers crossed and hope I'm the lucky girl!! I hope you feel better soon! I know how afwul migraines can be! Beautiful card. I love these WOJ stamps. I hope you feel better soonr, Katharina. Happy holidays. Beautiful card! This is such a cute image. Thanks for the chance to win him!! Gorgeous card!! I just love this image and would love to give it a home!! I can't believe that we are on #22 already!!! Thanks for the chance at so many beautiful stamps!! Hope your holiday season is fabulous!! ok, today has to be my lucky day! I love this WOJ stamp. I have the one where matthew is sitting with a present and I need this one to join him. LOL! I hope you are feeling better Katharina. What a cute card. I hope your head gets to feeling better fast. Good luck everyone. Beautiful card with soft colours. I like this kind of cards very much. Ich wünsche dir eine ganz schnelle Besserung. I hope your migraine improved as the day wore on - I was lucky and they stopped once I hit my late teens but I can sympathise, they used to wipe me out. Was für eine wunderschöne Karte. Der Stempel ist einfach ein Traum. THANKS SOO MUCH for sharing all your creative ideas with us i just love to browse, and keep coming back every few days to see whats new because in Sunny South Africa its still a very small hobby but growing. Keep the stunning cards coming. As always your stamps are super cute but your DT is amazing, always something beautiful for me to enjoy! Matthew is gorgeous, but I think you mean flying not lying. I have just ordered two Willow stamps and the sweep stamp. Ah, I have looked again and he is indeed lying not flying, I was wrong! what a lovely stamp! I do hope you get over your Migraine quickly, they are awful things and completely floor me!! Woo Hoo!!! I won! Thank you so much for playing Santa Claus to us all. I'm over the moon. I've just e-mailed my address. what a lovely little angel. Thank you for another chance to win, this who month has been amazing! And the stamps are just stunning. Hope you have a very happy holiday! Die Karte sieht wieder richtig toll aus. Hope your migraine gets better!!! A very, very cute card!!! I hope your migraine is getting better by now. Certainly don't need one during the holiday season. I have migraines too, it's horrible. I hope feel better now. Please take care and hope you feel better for the holidays! Oh,diese Motiv liebe ich ja auch total! Eine wunderschöne Karte ist das wieder! Wünsche Dir ganz lieb "Gute Besserung"! Maybe it's something in the air? I feel headachey/light-headed this evening: Going to bed to sleep it off. Hope we'll all be bright tomorrow. Lying Matthew is such a gorgeous thoughtful stamp. I really like this one. I have two little boys and I know there is an angel in them somewhere....crooked halo and dirty wings included! Merry Christmas!